We would like to congratulate our former Chief Executive, Rachel Noble, on becoming a member of The New Zealand Order of Merit for services to the deaf. Rachel has worked fearlessly to promote New Zealand Sign Language including during the Christchurch earthquakes, and in establishing New Zealand Sign Language Week and iSign. As a deaf person Rachel has brought a huge passion and energy to her leadership role, and she can be proud of the difference she has made. Minnie Baragwanath (MNZM) has played a leading role in social change for disabled New Zealanders over the last two decades. As Chief Executive of the Be.Institute she has influenced employers, local government and the community to aspire towards a fully accessible New Zealand. Her charismatic personality and optimistic spirit has made a huge impact in shaping attitudes, including establishing an expectation during the Rugby World Cup of an accessible Auckland. Robyn Scott-Vincent (MNZM) honoured for the social change she has inspired as CEO of Attitude Pictures for the Attitude television programme, the Attitude Awards Gala evening and the website Attitudelive.com. Elsewhere in the disability sector, Deaf Aotearoa would like to acknowledge the work of Mark Benjamin, Ruth Jones, Toni Sharp and Charmeyne Te Nana Williams. And lastly we also congratulate William Mager from the UK who will receive his OBE from the Queen for services to Deaf Broadcasting and Campaigning. In this role you will work within a trans-disciplinary team to support families/whanau with Deaf children aged 0-5, to develop New Zealand Sign Language (NZSL) and enhance effective communication and language acquisition. This position is based in Wellington and is for between 10 to 20 hours per week. Applications for this position close at 5pm on Monday 16 June 2014. For further information, and to submit your CV and a cover letter, please email bridget.ferguson@deaf.org.nz. We also welcome applications in New Zealand Sign Language. iSign has appointed a new booking coordinator for the Northern region (including Auckland and Northland). Her name is Jane Crown. She replaces the previous booking coordinator, Christie Mason, who left iSign to take up new opportunities. Contact details for iSign for Northern region bookings are still the same. Email addresse, mobile number, text number, phone number, fax number, etc are all the same. Jane lives in the South Auckland area, where she grew up. She is a mum to two children: a 18-year-old sun and a 14-year-old daughter. She hopes to meet the Deaf community soon. Christie said she will miss working at iSign, but she will still be around in the Deaf Community. She wishes everyone all the best for the future. A summary of minutes has been released in English and NZSL from the last New Zealand Sign Language Experts Advisory Group meeting held in Wellington on 11 March 2014. You can watch and read all minutes here: http://seeflow.co.nz/nzsl-eag. Dinner will start at about 5.30pm when we are ready to order. When: Friday 13th, kick off at 6.30pm. Game day sales: Adults $25 to $15, children $15 to $10, family of four $45 to $65. When: Monday 7th July at 2pm and July 11th at 10.30am. Book now for The Whale Rider live on stage during the Term 2 school holidays! Our poker tournament is now only a month away! For more information contact Ben Clifford deafpokernz@gmail.com. Senior artists Kura Te Waru Rewiri, Robyn Kahukiwa and Emily Karaka, along with next-generation painters Saffronn Te Ratana and Star Gossage, present fresh and fundamental approaches to contemporary Māori art. Included in the exhibition are significant historic examples of painted hoe (canoe paddle) and heke (rafter) from Auckland War Memorial Museum Tāmaki Paenga Hira, along with work by 19th-century artist George French Angas. Taonga and historic prints create a traditional context for the contemporary works. Are you up to date? A female nurse from Well Women will be at the new Takanini Family Service Centre to provide free cervical smear tests. She is also able to search the register to check if you are overdue. Who’s Brave Enough For A Mid Winter Swim??? Have a mini Hawaiian holiday at this free Winter Splash family fun day in Mission Bay! Come dressed in your best Hawaiian outfit. Registration opens at 1pm, followed by the swim from 2.15pm. There will be prizes, children’s entertainment and a free sausage sizzle. New Zealand artists with a passion for the New Zealand natural environment have created a diverse and unique range of mixed media work that reflect places in New Zealand sacred to them that they would like to see preserved & protected for future generations. This exciting and topical group exhibition comes with a strong environmental message at a time when we are aware of how under threat our oceans, rivers, lakes and natural environment are. There are many committed individuals and groups working hard every day in New Zealand to preserve and protect our environment. We hope to highlight the importance of individual responsibility and this being a time to take positive action to live up to our Clean & Green reputation. Our collective future depends on the steps we take to care for and protect our unique paradise at the bottom of the world. First class free! Classes start from $8 with purchase of a concession card… Experience moving with pleasure and joy in this playful class that reconnects your mind and soul to your body through Your Body's Way. No experience needed, no shoes needed either! "After a couple of sessions of Nia I was feeling excited to go, and a couple of weeks later I was feeling excited to get up in the morning!! Something very new to me.” – Nicola. For young people seeking career advice the Careers Expo is the best opportunity to get face to face with recruiters, tertiary and training providers and advisors to help you plan your vocation pathway. Whether you're leaving school or are trying to decide what and where to study next, you'll find information on which of New Zealand's industries need you and what they need you to know. The 2014 Careers Expo will also have food, music and competitions to keep you energised during the day. The event is open to all and parents, guardians and whanau are welcome to attend. There will also be presentations by experts, to help you make the most of your opportunities. James Bichan, manager of iSign, will be in Tauranga on Tuesday, 10th June. He would love to meet the community and hear your stories about access to interpreters, funding and any other comments you would like to share. James is also an interpreter so will be using NZSL to communicate directly with you. If you are available, please come to the Deaf Aotearoa office (Historic Village, 17th Avenue West, Tauranga) between 4-6pm on Tuesday 11th June. James looks forward to meeting you and sharing your stories! Keep up to date before, during and after an emergency by subscribing to one or both of the emergency alert systems. This is only for major emergency. The texting alert will not be used for weather alerts or minor localised incidents. They cannot guarantee Emergency Alerts will reach you during an emergency if there is a failure with signals, internet, backlogs etc. Do not reply on the texts as they will not be read or monitored and it will cost you money. Whakatane RSA Club on the 28 June is cancelled. Change of venue for the 28 June will be at the Club Mount Maunganui at 5:30pm. Click on flyer for more information and let BOP Deaf Club know if you are going so they can have numbers to book tables for dinner. Age restrictions: From 13 years up. No under 13's. Buy tickets before the walk. There will be no ticket sales on the night for safety reasons. An amazing night walk through Papamoa Hills to Summerhill Trails to enjoy coffee and cake. The walk is about 6km (1hr) and has beautiful views over Tauranga. Entrants are returned by minivan to their vehicles. 128 years have passed since Mount Tarawera erupted on June 10th 1886. Buried Village is having an open weekend to commemorate. Entry is free for the public for the whole weekend, and there will be entertainment for all ages. This is a speed-skating competition on roller skates. The Sulphur City Steam Rollers are proud to present Slam Rock 2014. The city's first roller derby event! Donna Allan, Deaf Advocate, will be in New Plymouth on Tuesday 17 June and Wednesday 18 June 2014. Send a text, email or fax to her to make an appointment. Let Donna know by 12 June. Will the Airs Shoot Down the Saints? Will the Good Home Mountainairs rise to the occasion? Infants under five years are free if they sit on a lap of a parent. Patrons 5 years to 17 years need to pay for a Child Pass. Come and kōrero with our Home Work artists Julianne Lafferty, Wayne Roberts and Dale Copeland and watch them at work. Come and watch as club members meet to carve hard stone or stroll around our permanent display and maybe purchase a unique sculpture for your home, work or garden! All are welcome to join us for a talk about the inaugural Taranaki Arts Trail, a positive initiative to showcase Taranaki’s diverse and talented artists, makers and creatives. Meet Amanda Hewlett who will discuss the development of the trail, its role in the arts community and ideas for its future. Free entry, coffee and tea provided, BYO lunch. Will the Airs Shoot Down the Nuggets? Will the Good Home Mountainairs rise to the occasion? Moko is now worn by many young Māori as a symbol of identity and ethnic pride, although it almost died out in the 20th century. In the second Ten by Ten talk, Professor Ngahuia Te Awekotuku tells the story of the history of moko and its revival as investigated and documented by a Marsden-funded research team. The search for information led them to manuscripts and artefacts held by institutions across the world. Community participation was an essential part of this work. The pan-tribal team interviewed moko wearers and artists and examined the cultural and spiritual issues surrounding moko, including the controversy sometimes apparent in modern life. MTG Hawke’s Bay has a diverse collection of taonga relating to the art of moko. MTG Hawke’s Bay will be opening its exhibition galleries from 6.00pm – 7.30pm for audience members to view prior to the talk, free of charge. 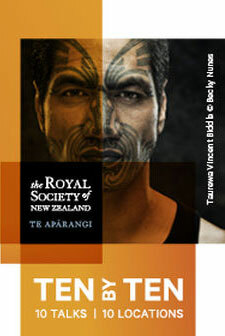 Enquiries: 04 470 5781 or lectures@royalsociety.org.nz. Wrap up warm and join us for this annual mid-winter festival to celebrate the rise of the Matariki star cluster heralding the arrival of the Maori New Year. Light a candle lantern in thanksgiving for the harvest and new year planting season. There's soloists, bands, kapa haka and hip hop dancers. Enjoy a range of hot kiwi kai on offer. There's kiddies rides and slides and a spectacular fireworks display rounds off the night. Free return buses will be operating from Porangahau, Takapau, Waipukurau and Waipawa.Contact us for details. A huge thank you to Te Aute College for allowing us to bring this public event onto school grounds. Everyone welcome to this free event. Thanks also to our funders the Lion Foundation, Te Puni Kokiri - Ministry of Maori Development and Ngati Kahungunu Iwi Inc. This is the 3rd year of our iconic Hawkes Bay owned and operated fundraising event. Sensational course with lots of variety and Mud! Situated in a natural ampitheatre, the course contains everything from a lake, an island, stopbank, shingle mountains, vineyard track, mudslide, camo crawl, bugzapper, mudder bar creekbeds, gentle hillsides. The spectator viewing platforms are superb for those supporting. See our website for more details and up to date information. Deaf Club is closed this Friday 6th June. Matariki is the Maori name for the cluster of stars. It rises just once a year in mid-winter, for Māori people it means the start of a new year. Traditionally it was a time to remember those who had died in the last year. But it was also a happy event, crops had been harvested and seafood and birds had been collected. They sing, dance and feast. Play games, activities, sign singing all using basic vocabulary from NZ Sign Language. Fun and interactive way to learn for everyone. For more information contact: info@voicethruyourhands.org.nz or text Ally 027 276 4590. Come and enjoy some craft time with other local crafters and enjoy a cup of tea. Bring some handiwork - all ages welcome, beginners to advanced welcomed! This is held at the Sound & Vision Zone in the Central Library. Gather your friends to go check this out. Victoria University of Wellington is offering a new Intermediate NZSL course, DEAF 802. The course will extend intermediate (2nd year level) signers’ skills for everyday communication with Deaf people, by teaching more advanced vocabulary, grammar, and discourse skills. Taught by Deaf lecturer Dr David McKee, and Dr Rachel McKee. The prerequisite is DEAF201 or equivalent NZSL proficiency (approx 18-24 months of NZSL). For enquires phone Rachel McKee 04 463 5626 or email rachel.mckee@vuw.ac.nz. Enrolment deadline June 21st. Ph 0800 842 867 (option 4) for enrolment. Comm-Clear is a world-wide mobile app that allows consumers (Maori, Chinese, German, Deaf, English and non-English) access to an Interpreter at the push of a button. RSVP by 13th June or for further information: marketing@comm-clear.com.au or visit their website: www.comm-clear.com.au. Please see flier of what will be included at the evening. You can nominate any not-for-profit group or organisation working in the interests of the community (including your own). Key factors considered during judging are: volunteer input, utilisation of resources, innovation and creativity, effectiveness of activities, impact within the community. All groups nominated in Wellington will be invited to a Wellington Awards function hosted by the Mayor in early September. Nominations are open until 30th June 2014. Although racing is very important part of the weekend, its not just about the horses. Bring the whole family for a fun day out! We are having our Mid-Winter Christmas lunch at Hangar58. Please arrive at 11am for a drink and catch up. The cost of the lunch varies from $10-$28. There is a visitor coming from the North Island to join us for lunch, we hope to see you there. Let Rachel the secretary know if you require transport. After the lunch there is a table booked at the Suburban club. Raffle starts at 4.30pm then catch up and watch the Rugby game Crusaders VS Harricanes at 7.35pm. Our previous office at Kilmore Street have been sold and we are currently looking for a permanent property until further notice. You would be able to communication with hearing people anywhere, anytime with an interpreter on your mobile phone – a new app will be launched in New Zealand. 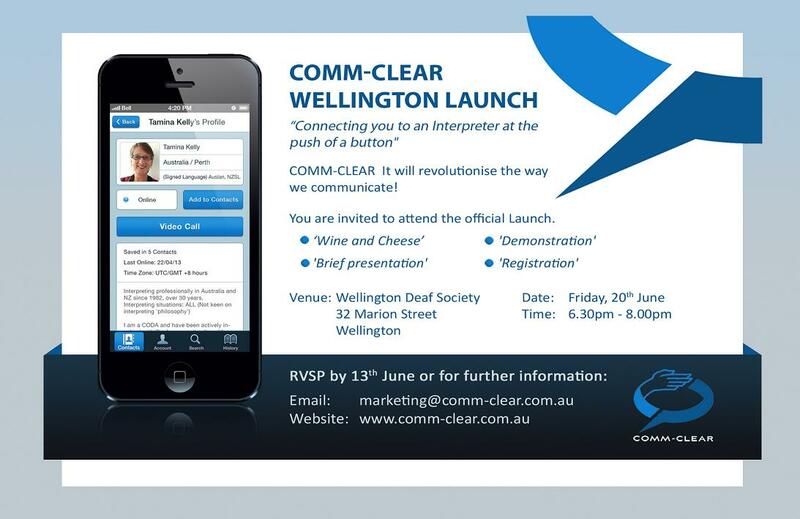 Do you want to find out more about Comm-Clear – please attend the launch to learn and ask question there. Do you want your children to attend Mitre 10 DIY events to make something? A tutor, Flip Leijten, will be giving a small workshop at each month on a Sunday from 11am to 12pm. The workshop is designed and suitable for younger children in a age group 4 to maximum 12 years old. Please bring old clothes and one parent/caregiver to help with your children’s project. Enrolment are required to book as soon as possible as the workshop are fill up quickly! Deaf Social night Friday 13th March is cancelled. Information about the camp is available from the office please come and see Fi if are interested. If you would be interested in coming to a Midwinter Christmas Dinner please contact Fi at the office. Started in 1997 and featuring over a decade of lantern processions, the 2014 Dunedin Midwinter Carnival will once again dazzle participants of all ages. The theme for this year's event is 'A Winter Dreamland', referencing the surreal and enchanting world on the other side of the pillow. The event celebrates Matariki and the Winter Solstice (the longest night and shortest day of the year) – a great time for dreaming indeed. In this exhibition by the Danish artist Olafur Eliasson, thousands of white Lego bricks await an audience to transform them into art. Come build houses, robots, trucks and much much more all from LEGO blocks. Great to see so many at our last coffee group. Hope to see you all again! There is an opportunity for someone to teach some NZSL classes in Invercargill. Due to NZSL Week there has been a lot of interest from the public for learning NZSL. If you are interested in teaching some classes please get in contact with Rebecca at the office. Or if you know of anyone who would be interested please let them know about this opportunity. The teacher will need some NZSL qualifications.